The warmth of the holiday season brings cheer to more than 25 Walt Disney World Resort hotels annually, and this year will be no different. Every resort across Walt Disney World will be dressed up in its holiday best. Music fills the air and even includes carolers that perform on select nights at many of the resorts. The holidays are truly a magical time of the year at Walt Disney World. At Disney’s Wilderness Lodge, guests can take in Pacific Northwest yuletide cheer beneath the gorgeous lobby Christmas tree, as they sit in a big rocking chair near the fire relaxing with a cup of hot cider and snacking on holiday treats. They can also relax by the lake while enjoying a seasonal cocktail at Geyser Point Bar & Grill, then head out to the campfire to make s’mores and enjoy hot chocolate at nightfall. At Disney’s Fort Wilderness Resort and Campground, the Hoop-de-Doo Musical Revue goes all out for the season with live holiday music by the Pioneer Hall Players, including favorites like “There’s No Place Like Home for the Holidays” and “Another Tennessee Christmas.” On select nights throughout the season, the campground’s beloved carolers arrive by hay wagon spreading holiday cheer to all. 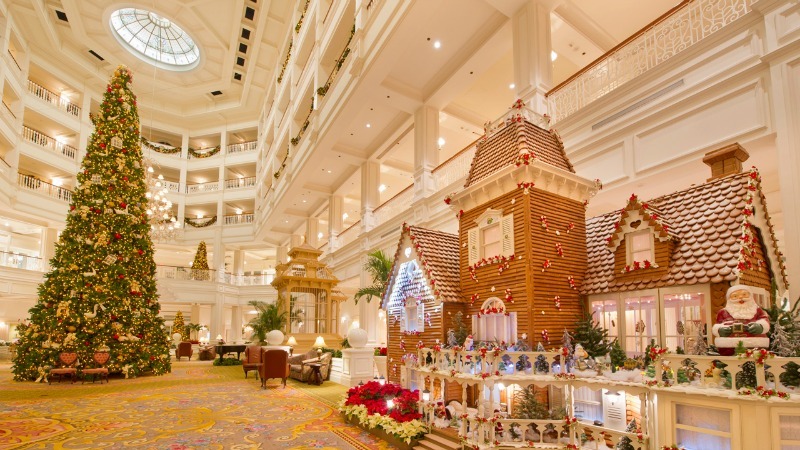 A favorite annual treat located at Disney’s Grand Floridian Resort & Spa is a life-sized holiday gingerbread house. This eye-filling (and aromatic) sight is in the resort lobby and is home to The Bake Shop that uses a classic gingerbread recipe from Austria for its tasty cookies and ornaments. Take home a miniature gingerbread house to deck your own halls once you return home from vacation!